The sweeper can be used to sweep sand between and in pavement. The sweeper distributes the sand evenly on the surface. 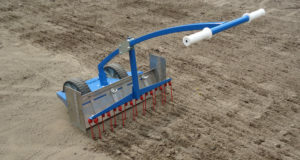 The seed rake can be used for evenly loosening soil and to rake in grass seed after sowing. 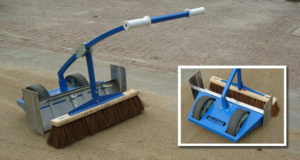 Both sweeper and seed rake can be mounted onto the Keeroo by using a clamp which is available separately.